Innovative education for school students. Fill this form for details! At-school solutions for young learners! Aptech Limited is an international education company. Present in more than 40 countries, Aptech has successfully provided career education to more than 7 million people around the world. The company’s education solutions cover individual education as well as corporate training. With Aptech Learning Ladder, the company offers school-level education - with great results! Aptech Learning Ladder is a 360-degree program that is both, innovative in nature and simple to teach & use. With Learning Ladder, Aptech introduces children at kindergarten levels and above to the joys of computer-based learning. With these programs, interactivity is key; kids get an opportunity to play and learn simultaneously. The end result is an increased interest in, and passion for, learning, from a very young age. Aptech is excited and proud to have introduced this program to schools across the globe. Fittingly, we have received an enthusiastic welcome from progressive thinkers who believe in the power of technology to enhance the quality of education. Aptech Learning Ladder uses technology effectively to supplement classroom learning for students from kindergarten through class 8. The program introduces students to innovative ways of learning such that they develop basic skills and build a strong foundation for a lifetime of learning. To deliver the Learning Ladder programs efficiently, Aptech has partnered with schools, government projects and kindergarten education chains. Wish to explore innovative methods of education through Aptech Learning Ladder? Please fill the enquiry form. We will contact you soon. Each program is interactive that incorporates ‘fun-while-you-learn’ elements. Students enjoy the benefits of experiential and theme-based learning, which helps develop a strong foundation for classroom learning. Aptech Learning Ladder merges learning with fun. Students get trained by Aqualand’s imaginary characters, which makes technology concepts easy and engaging for children. Aqualand, a fun-filled underwater city, depicts an ever changing and evolving digital world. 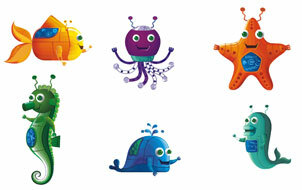 Characters like the octopus, the dolphin and the whale present fun-filled and exciting options for students to explore during the course of the program. With a perfect mix of information, knowledge and entertainment, Aptech Learning Ladder offers an all-round approach to learning computers. What does Aptech Learning Ladder provide? Apart from revolutionary, interactive computer-based training modules, Aptech Learning Ladder also offers supplementary resources. This is a theory guidebook for students. Developed in an interactive fashion, this is technology-made-easy through the use of visuals and examples. Designed to aid teachers in delivering the Aptech Learning Ladder programs effectively, the Teacher’s Guide helps your faculty conduct each program in a step-by-step, optimized manner. The Lab Guide helps get the best results out of the time that your students spend in the computer lab. This is the complete guide and support for all practical learning aspects. The exercises, worksheets and handouts in the student workbook help reinforce and assess the learning of each student. With Aptech Learning Ladder, we seek to provide 360-degree support not just to the student, but also to our partner institute. The idea is to introduce innovative education in an easy, step-by-step fashion. Wish to bring innovative education to your students? Leave your details & queries with us! We will contact you soon.